A deserved penalty gave France an undeserved lead, and they held on to overcome Germany in the game of the tournament. Despite missing key players, Germany were definitely unfortunate not to have a lead at halftime, and probably the better side in a much tighter second half. But Antoine Griezmann capitalized on two errors, virtually ensuring himself the Golden Boot and securing France’s place in the final against Portugal. France were unchanged from their last game against Iceland, Moussa Sissoko and Samuel Umtiti remaining in the starting XI despite the availability of N’Golo Kante and Adil Rami, Griezmann continuing in the middle underneath Olivier Giroud. Germany’s manager Joachim Löw faced more difficult selection problems, with Mario Gomez and Sami Khedira injured and Mats Hummels suspended. Returning to a back four allowed Benedikt Höwedes to partner with Jérôme Boateng in place of Hummels, and Bastian Schweinsteiger’s unexpected availability helped to allay the shortfall in midfield. Recognizing Schweinsteiger’s fitness was an issue, Löw added tournament debutant Emre Can to a 4-3-3 midfield. That left Thomas Müller to replace Gomez up top, with Julian Draxler coming in on the left and Mesut Özil shifting over to the right. France started the game brightly, attacking down the left and creating a good chance for Griezmann early. 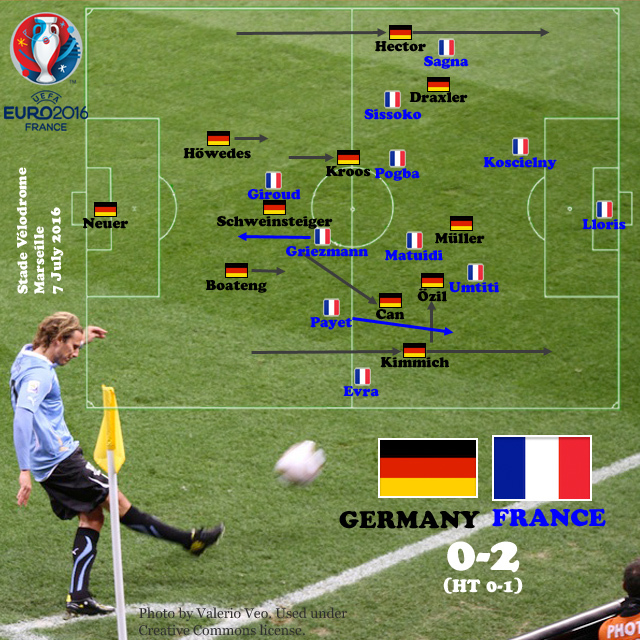 But within ten minutes, Germany had established the dominance that would characterize the first half. Two key factors contributed to this shift. First, Boateng stepped up alongside Schweinsteiger, who was playing as a lone holder well behind Kroos and Can, helping to share the burden of distributing from the back with him. Second, Joshua Kimmich began attacking down the right and getting in behind Patrice Evra to put France on their heels. Notwithstanding his role in creating France’s second goal, Kimmich had an amazing game and over the tournament has secured his claim as Philipp Lahm’s long-term replacement at right back. Once in control of possession, Germany adopted a remarkably high attacking position. Kimmich and Jonas Hector were essentially attacking wingers, which, according to Michael Cox, “created, at times, a 2-3-5 system.” In fact, the aggressive movement of Can made it more like a 2-2-6, at times. Positioned somewhat higher than Kroos from the outset, Can consistently pushed up into the attacking line and out right, allowing Özil to tuck inside like a classic inside right forward. Though he would drop back in defense, Can spent most of the game in this attacking role. Kroos, for his part, tended to set up slightly behind Germany’s attacking line, helping to distribute from left-of-center. Behind him, but usually well inside France’s half, Boateng and Höwedes stepped up alongside Schweinsteiger to provide a high-base from which to orchestrate Germany’s attack and to snuff out the rare French counter-attack. Schweinsteiger, in particular, was an excellent first line of defense, showing remarkable positional sense when needed. Germany’s 68% possession in the opening 35 minutes accurately suggests their dominance, and France was under constant threat during the first half. Schweinsteiger’s hand ball could not have been more against the run of play. In the second half, Payet and Sissoko sat deeper, shifting into a defensive 4-4-2, but the overall complexion of the match changed little. After another sharp opening by France, Germany took charge of the game, albeit with France offering a more serious counter-attacking threat. With 20 minutes remaining, Deschamps further hunkered down, bringing N’Golo Kanté into the midfield and moving Blaise Matuidi out left to replace Payet. On the restart, Matuidi’s pressure on Kimmich led to a turnover inside Germany’s box that set up France’s second goal. Following the goal, France was even better equipped to defend and wait for opportunities to counter. Germany may have been unfortunate, but two key issues contributed to the loss. Given their difficulty finishing, Gomez’s absence up top stands out. He was their top scorer in the tournament, and not unlike Giroud, his French counterpart, he started the tournament over fans’ objections and ended it as one of the most important contributors. Of course, Gomez’s absence was magnified by Müller’s inability to finish, part of a pattern of critical failures by Germany’s senior players in their last two games. Boateng and Schweinsteiger’s hand balls, the penalty misses of Schweinsteiger, Özil, and Müller, and Müller’s lack of finishing all point to a senior core that came up short at the business end of the tournament. Rather than a lack of “heart” or “desire,” I might point to extended regular seasons as a culprit in wearing these players down. Müller played 49 games for Bayern Munich, second only to Manuel Neuer and Robert Lewandowski (who also had an underwhelming tournament). Boateng played 31 games, while Özil played 45 games for Arsenal. Schweinsteiger was not heavily used this season because he was frequently injured, as was the case for much of the previous season and in the build-up to this game. In addition to the hand ball, Schweinsteiger was in the best position to close down Griezmann on France’s second goal. Whatever the cause, it was the core German players who were unable to raise their game. There are, of course, other players in the tournament who have played extensively this season, not least of them Griezmann, who had 54 appearances–though it is worth noticing Michael Cox’s observation that “Griezmann simply didn’t have the energy to [drop onto Kroos defensively]: although he contributed both goals and continually offered acceleration at turnovers, it’s clear he is exhausted.” But this may not matter against a Portuguese side that is more focused on destroying than on creating. The final is unlikely to provide the raw entertainment of this semifinal; the best we can probably hope for is a chess match between a great attacking side and a powerful defensive one hoping to score on a counter or set piece. For a good tactical preview of the final, I recommend would Michael Cox’s ESPN FC preview. It will be interesting to see if either side makes changes beyond the return of the suspended William Carvalho for Portugal. Manager Fernando Santos will certainly hope that Pepe can also return to the side, but he has not yet trained with the team. One unlikely possibility would be playing both Carvalho and Danilo Pereira to try help Griezmann. For Deschamps, the choice is between sticking with his current starting XI for a third straight game or returning to a 4-3-3. Probably, he will opt to keep Griezmann in the middle. Expect a cagey final with few chances. The best neutrals can hope for is an early France goal to open things up, or barring that a few magical moments from Griezmann or Cristiano Ronaldo. Honestly, how much bad luck can one team have? When they lost Boateng due to injury, too, I knew this was over. Oh, well, hopefully they will get a string of good luck in two years to make up for it after two tournaments in which the team had to fight against one unlucky incident after another. Hard to argue with that. I did think Mustafi played well replacing Boateng. I think I expected Muller to step up, but it’s not like Germany didn’t have chances in the game. He did well enough, but Boateng is the leader of the German defence, and it is unusual that they play without him AND Hummels (and Hummels shouldn’t have been banned from the game in the first place, since he got his first yellow for an action which wasn’t even a foul). For some reason Müller always chokes during the Euros…but he isn’t really the problem. The team has still found an adequate replacement for Klose. It usually doesn’t matter because if the defence is tight, then the goal will happen sooner or later. But I hope that Sane will be ready to take Klose’s role in two years.